Background Low serum levels of 25-hydroxyvitamin D3 are associated with an increased risk of respiratory tract infections (RTIs). Clinical trials with vitamin D3 against various infections have been carried out but data are so far not conclusive. Thus, there is a need for additional randomised controlled trials of effects of vitamin D3 on infections. Objective To investigate if supplementation with vitamin D3 could reduce infectious symptoms and antibiotic consumption among patients with antibody deficiency or frequent RTIs. Setting Karolinska University Hospital, Huddinge. Participants 140 patients with antibody deficiency (selective IgA subclass deficiency, IgG subclass deficiency, common variable immune disorder) and patients with increased susceptibility to RTIs (>4 bacterial RTIs/year) but without immunological diagnosis. Intervention Vitamin D3 (4000 IU) or placebo was given daily for 1 year. Primary and secondary outcome measures The primary endpoint was an infectious score based on five parameters: symptoms from respiratory tract, ears and sinuses, malaise and antibiotic consumption. Secondary endpoints were serum levels of 25-hydroxyvitamin D3, microbiological findings and levels of antimicrobial peptides (LL-37, HNP1–3) in nasal fluid. Results The overall infectious score was significantly reduced for patients allocated to the vitamin D group (202 points) compared with the placebo group (249 points; adjusted relative score 0.771, 95% CI 0.604 to 0.985, p=0.04). Limitations A single study centre, small sample size and a selected group of patients. The sample size calculation was performed using p=0.02 as the significance level whereas the primary and secondary endpoints were analysed using the conventional p=0.05 as the significance level. Conclusions Supplementation with vitamin D3 may reduce disease burden in patients with frequent RTIs. Recent evidence suggests that vitamin D3 has potent extraskeletal effects, such as suppression of inflammation and strengthening of mucosal immunity by induction of antimicrobial peptides. Data from observational studies suggest that low levels of 25-hydroxyvitamin D3 are associated with an increased risk of respiratory tract infections. Results from a limited number of randomised controlled trials on the protective role of vitamin D3 against respiratory tract infections are inconclusive and thus additional studies are warranted. Therefore we designed and carried out a randomised controlled trial where a large dose (4000 IU) of vitamin D3 was given to patients with an increased susceptibility to infections for 1 year. A high daily dose of vitamin D3 was used, the study time was a full year covering all seasons and patients with an increased frequency of respiratory tract infections were studied. A single study centre, small sample size (n=140) and a selected group of patients. Low levels of 25-hydroxyvitamin D3 are associated with an increased risk of tuberculosis6–8 and respiratory tract infections.9 The mechanism is not fully elucidated but vitamin D3 has been shown to induce antimicrobial peptides in immune cells.10 In addition, active vitamin D3 (1,25(OH)D3) has broad anti-inflammatory effects on the adaptive immune system by shifting the T helper cell pool from a Th1/Th17-response to a Th2/Treg-dominated response.11 ,12 Vitamin D3 has also been shown to suppress the Th2-response in allergic bronchopulmonary aspergillosis.13 Thus, vitamin D3 modulates both the adaptive and innate immune system.14 The bulk of data on vitamin D3 and infections stems from in vitro experiments and retrospective observational studies. Results from randomised controlled trials (RCTs) where the effects of vitamin D3 on infections have been investigated (reviewed by Yamshchikov et al15) are not conclusive and larger clinical trials are therefore warranted. We designed a study to test the hypothesis that 4000 IU of vitamin D3 given daily to patients with antibody deficiency and frequent respiratory tract infections for 1 year could prevent or ameliorate infections. In addition, we investigated whether genetic polymorphisms in genes involved in the effect and/or metabolism of vitamin D3 have an influence on the outcome of vitamin D3 supplementation. A prospective, randomised, double-blind placebo-controlled study of vitamin D3 supplementation in patients with an increased susceptibility to respiratory tract infections. The study was approved by the local Ethical Committee and the Swedish Medical Product Agency and was performed in accordance with the declaration of Helsinki. Written informed consent was obtained from all study participants. The study was registered at www.clinicaltrials.gov prior to inclusion of the first patient (NCT01131858). The EudraCT number is 2009-011758-16. The full protocol is available from the corresponding author upon request. The sample size was based on the assumption that the intervention would reduce the number of days with symptoms from 42 (210 points) to 28 days (140 points), that is, a reduction of the infectious burden by 30%. Given this assumption, a sample size of 60 patients per study group was predicted to provide the study 90% power at a significance level of p=0.02 (Student's t test). To compensate for predicted exclusion of participants, the groups were increased to include 70 patients per treatment arm. Importantly, the significance level of p=0.02 was chosen in the power calculation to ensure that a sufficient number of patients were recruited in order to avoid a type II error in the primary analysis. However, the conventional and widely accepted significance level of p=0.05 was used for statistical analyses of the primary and secondary endpoints. Patients at the Immunodeficiency Unit, Karolinska University Hospital, Huddinge, Sweden, were included between March and June 2010 by the study nurses (SH, ML and KJ). Inclusion criteria were age 18–75 years and an increased susceptibility to respiratory tract infections; that is, >42 days with symptoms from the respiratory tract during a 12-month period prior to study inclusion. Patients registered at the Immunodeficiency Unit are closely followed up with a diary of symptoms and antibiotic consumption. Thus, the patients are trained and used to apply such an instrument to assess their infectious status. Data from patients’ standard diary were used as an instrument in order to assess patients for eligibility, both via telephone and by the responsible physician (PB and ACN) prior to inclusion. Patients with selective IgA-deficiency (D80.2), IgG-subclass deficiency (D80.3) and common variable immune disorder (CVID, D83.0) as well as patients without a defined immunological diagnosis (D89.9) were included. Exclusion criteria were prophylactic treatment with antibiotics, history of hypercalcaemia or stones in the urinary tract, sarcoidosis, ongoing supplementation with vitamin D3 exceeding 400 IU/day, HIV-infection and pregnancy. Patients were randomised to 12 months’ treatment with vitamin D3 (Vigantol, 4000 IU/day, Merck GmbH, Darmstadt, Germany) or placebo oil. One drop contained 500 IU vitamin D3 or placebo oil (Miglyol oil, Merck GmbH, Darmstadt, Germany) and the participants were asked to take eight drops daily. The participants had to mark their daily symptoms of infection in a diary, which was sent via regular mail to the study site every month. The following data were recorded: symptoms from the respiratory tract, ears and sinuses, treatment with antibiotics, numbers of bacterial cultures, times and reasons of visits to hospitals, frequency of travelling abroad and adherence to study drug. The primary outcome was a composite infectious score, based on a daily patient-reported questionnaire and included five parameters: symptoms from the respiratory tract, ears and sinuses, malaise and use of antibiotics (see online supplementary figure S1), each parameter gave 1 point/day. The occurrence of x-ray verified pneumonia gave three additional points per day for a period of 7 days. Thus, a pneumonia resulted in 3×7 points=21 extra points. Patients were specifically instructed to record only symptoms related to ongoing respiratory tract infections. Symptoms related to infections at other sites (urinary tract, wounds, etc) as well as non-infectious symptoms were reported as adverse events. Secondary outcomes were serum levels of 25-hydroxyvitamin D3 (at baseline and after 3, 6, 9 and 12 months), numbers of bacterial cultures, microbiological findings and levels of antimicrobial peptides (LL-37 and HNP1-3) in nasal fluid (at baseline and after 6 and 12 months). In addition, six post hoc genotype analyses were performed in all participants. Analyses of single nucleotide polymorphisms (SNPs) were carried out for VDR (Taq1 and Foq1), CYP27B1, CYP24A1, CYP2R1 and vitamin D binding protein (GC). Safety tests included plasma levels of creatine, calcium, phosphate and albumin, measured at baseline and after 3, 6, 9 and 12 months. At inclusion, urine-HCG (human chorionic gonadotropin) in women was measured and p-parathyroid hormone was measured in both genders. The results of the safety tests were reviewed by an independent and unblinded consultant physician. Two blinded physicians (PB and ACN) were responsible for inclusion and all medical visits to the study site (Immunodeficiency Unit, Karolinska University Hospital, Huddinge, Sweden). Participants were randomised to 12 months’ treatment with vitamin D3 (Vigantol, 4000 IU/day) or placebo oil. Block randomisation with a block size of ten was used to ascertain equal group sizes. Staff at Karolinska Trial Alliance was responsible for randomisation procedures. In the statistical analysis, continuous variables were compared using Mann-Whitney U test or linear regression and dichotomous variables by Fisher's exact test or logistic regression. Regressions of log-transformed infectious scores were performed both unadjusted (simple regression) and with adjustment for potential confounders (multiple regression). The distribution of the infectious score was found to be skewed, thereby violating the normal assumption of the prespecified t test analysis. Hence, scores were log-transformed prior to analysis. Further, the randomisation had resulted in age distributions that were not entirely balanced between the two groups. Since there might be concerns that such imbalance could influence the results of the study, the original analysis plan was extended with a multivariable analysis adjusting for potential confounders. In this linear regression model based on log-transformed values of the primary outcome (the total infectious score) and its individual components, adjustment was made for age, gender, smoking, type of immune deficiency and significant comorbidities (respiratory or non-respiratory). Because of the transformation procedure, the adjusted effect of vitamin D3 is expressed as a ratio between the score in the vitamin D3 and the placebo group. In this multiplicative model, an effect size of 1 indicates identical outcome in the two study groups and statistically non-significant results are recognised by CIs encompassing the value 1. To explore potential divergent effects on different organ systems, both adjusted and unadjusted analyses were repeated separately for each individual item of the infectious score. In addition, the temporal aspects of the vitamin D3 effect were investigated by dividing the study period into four 90-day periods (starting on the first day of treatment) and repeating the analyses separately for each time period. ‘Ear’ and ‘sinus’ symptoms as well as ‘antibiotic use’ occurred at low frequencies and for these entities normal distributions could not be achieved despite data transformation. Thus, the adjusted analyses of these individual items were based on multivariable logistic regression, after coding the symptom (or antibiotic therapy) as present or absent during the course of the study. However, this only applies to analysis of the individual items, and not to the primary analysis of the total infectious score, where all item scores were added as originally described. Most postrandomisation exclusions were due to patients failing to fill out the symptoms diary. Hence, no intention-to-treat (ITT) analysis based on actual outcome data could be performed. However, the potential impact of dropouts was addressed in an ITT analysis based on multiple imputation of missing outcome data. In the imputation process, pooled estimates were derived from 100 datasets created by means of multivariate imputation by chained equations and predictive mean matching for the same covariates as in the adjusted per-protocol analysis. Detailed descriptions of randomisation and blinding, sampling of nasal fluid, measurement of antimicrobial peptides, measurement of 25-hydroxyvitamin D3, genotyping and statistical analyses of secondary outcomes are presented in the supplementary methods section. A total of 286 patients were first assessed for eligibility but 144 were not included because they did not fulfil all inclusion criteria; <42 days with infection/year (n=35), lacked other inclusion criteria (n=42), or declined to participate (n=67). The remaining 142 patients were further screened and 140 patients were included in the study. Of these, 70 were randomised to vitamin D3 supplementation and 70 to placebo (figure 1). The groups did not differ with regard to gender, IgG replacement therapy, smoking, baseline 25-hydroxyvitamin D3 levels, type of immune defect or comorbidities (table 1). Patients with subclass deficiency, selective IgA deficiency (sIgAD), CVID and patients without a defined immunological diagnosis (ND) but with >4 bacterial respiratory tract infections/year were included. IgG replacement therapy was most common in the CVID group (100%) and in the subclass deficiency group (63%), and also frequent in the other groups (ND, 54% and sIgAD, 38%, see online supplementary table S1). Patients allocated to the placebo group were slightly younger than patients in the treatment group (p=0.025, data not shown). During the course of the study, 16 patients left the study prematurely (8 patients from each study group) and consequently 124 patients were included in the main per-protocol analysis. 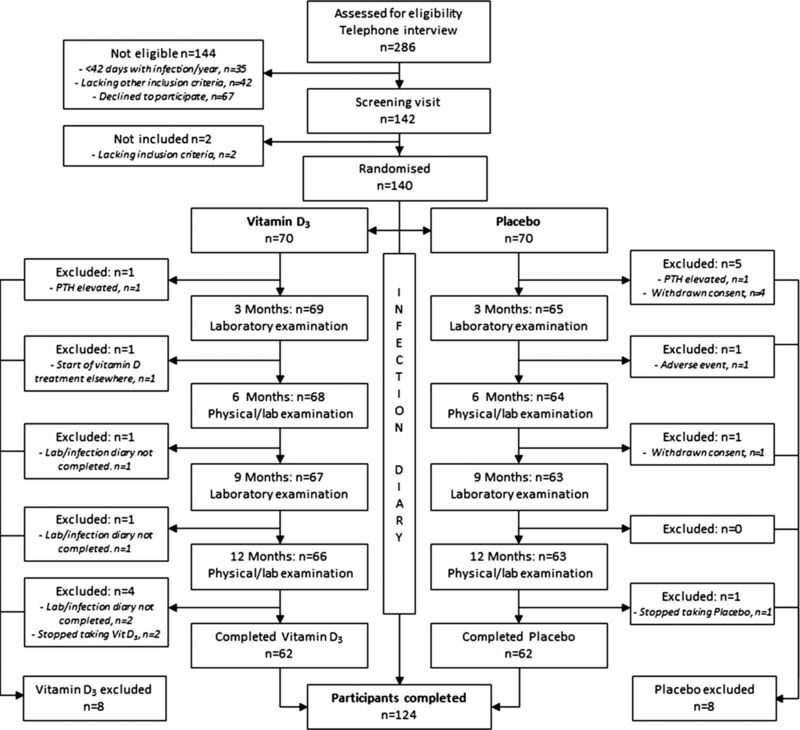 Reasons for dropout included elevated parathyroid hormone (n=2), withdrawn consent (n=5), adverse events (n=1), prescription of vitamin D outside the study (n=1), failure to complete diary (n=4) or non-compliance to study medication (n=3; figure 1). One year of vitamin D3 treatment was associated with a significantly reduced total infectious score both in the unadjusted (n=124, p=0.024; table 2) and in the adjusted analyses (n=124, p=0.040; table 2; figure 2A,B and see online supplementary table S2). The unadjusted relative score in the intervention group was 0.754 (95% CI 0.591 to 0.963, p=0.024, n=124) corresponding to a 25% reduction and after adjustment for potential confounders, the relative score was 0.771 (95% CI 0.604 to 0.985, p=0.04), corresponding to a 23% reduction (table 2). According to the temporal analysis, the effect of vitamin D3 supplementation tended to improve with time (figure 2A). The absolute unadjusted score per patient was 202 points for the vitamin D group and 249 points for the placebo group, a significant reduction of 47 points per patient (p=0.023, Mann-Whitney U test, see online supplementary table S3). Primary endpoint. The adjusted total relative infectious score (A) is expressed ‘per quarter’ (3-month periods). 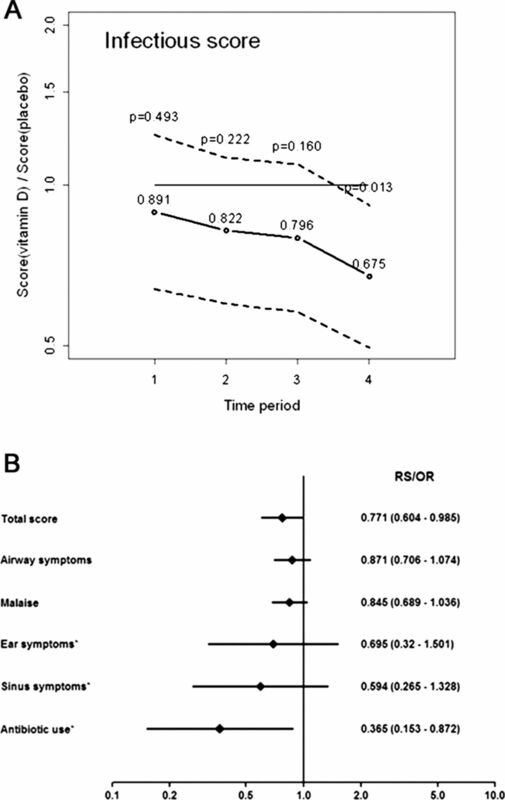 The adjusted 1-year scores (total score, airway, malaise, ear, sinus and antibiotics) are depicted in a Forest-plot (B) together with 95% CI. Effects are presented as relative scores (total score, airway and malaise) or OR (ear, sinus, antibiotics and indicated with asterisks). When the individual items of the infectious score were analysed separately, all point estimates indicated a reduction in the treatment group (table 2, see online supplementary figure S2), although only antibiotic consumption reached statistical significance (figure 2B and see online supplementary figure S2, panel E). The adjusted OR for antibiotic use was 0.365 (95% CI 0.153 to 0.872, p=0.023, n=124), that is, a 63.5% reduction of the odds of antibiotic use in the intervention group (table 2). The absolute values were 33 days on antibiotics for the placebo group and 16 days for the vitamin D3 group, that is, a reduction of 17 days in the vitamin D3 group (see online supplementary table S3). The temporal trends for specific symptoms and antibiotic consumption were similar to the total score and reached statistical significance for ‘ear’-symptoms (n=124, p=0.041) and for ‘malaise’ (n=124, p=0.053) in the final quarter of the study (see online supplementary figure S2, panels B and C). Analysing the primary outcome according to ITT (n=140) produced results virtually identical to those of the per-protocol analysis. In the unadjusted ITT analysis, vitamin D3 reduced the total infectious score by 25% (relative score 0.752, 95% CI 0.588 to 0.962, p=0.024) and after adjustment for potential confounders the reduction was 23% (relative score 0.767, 95% CI 0.599 to 0.982, p=0.036). 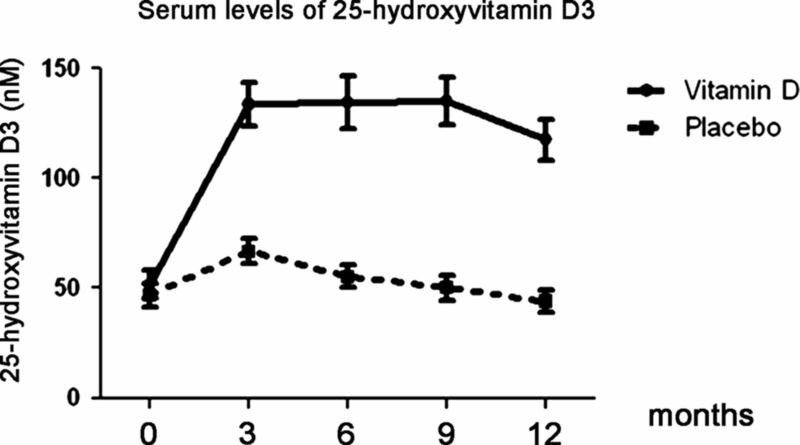 Serum 25-hydroxyvitamin D3 levels did not differ between the groups at baseline (table 1) but already after 3 months the intervention group had a significantly higher level of 25-hydroxyvitamin D3 (133.4 vs 66.6 nmol/l, p<0.001; figure 3). This increase remained throughout the study (figure 3). Secondary endpoint. Vitamin D levels. Serum was collected at days 0, 3, 6, 9 and 12 months and levels of 25-hydroxyvitamin D3 were measured. Values are expressed as mean±95% CI. During the course of the study, 173 microbiological samples were obtained in the vitamin D3 group (n=62, 2.79/patient) and 301 in the placebo group (n=62, 4.85/patient; p=0.010; table 3). The number of samples with at least one positive finding was higher in the placebo group, with close to statistical significance (p=0.052), while the fraction of positive samples was similar for both groups (table 3). Significantly more patients had a microbiological sample taken from the respiratory tract (≥1 sample) during the study period in the placebo group; OR 2.63 (95% CI 1.17 to 5.92; table 3). In total, the vitamin D3 group generated 76 positive microbiological findings (bacteria or fungi), compared with 159 in the placebo group (p=0.023). There was no difference between the groups for the traditional respiratory pathogens (Haemophilus influenza, Moraxella catharralis and Streptococcus pneumonia), but there were significantly fewer findings of Streptococcus aureus (p=0.019) and fungi (p=0.028, Candida spp. and Aspergillus spp.) in the treatment group (table 4). Likewise, significantly fewer vitamin D3-treated patients had a bacterial culture positive for S aureus (p=0.019) or fungal species (p=0.058), although the latter difference did not reach statistical significance (table 4). Vitamin D treated patients with subclass deficiency left significantly fewer bacterial or fungal cultures than placebo-treated patients with this diagnosis; seven cultures in the vitamin D group (n=22) versus 47 cultures in the placebo group (n=24) (see online supplementary table S4). Also the number of patients that had ≥1 bacterial culture taken was significantly fewer in the placebo group (12/22 vs 22/24, p=0.0065, see online supplementary table S4). There was no significant effect of other immunological diagnoses on bacterial cultures or microbiology (see online supplementary table S4). Since concomitant lung disease may be an important factor for vitamin D mediated effects on respiratory immunity, we performed a detailed analysis of bacterial cultures and microbiology of patients with asthma, bronchiectasis (BE) and chronic obstructive pulmonary disease (COPD). The numbers of patients with these diagnoses were quite small, which preclude any firm conclusions regarding any effect. However, there was a trend—however not significant—that vitamin D-treated patients with asthma produced fewer bacterial cultures (average 2.9 cultures/patient vs 7.0 cultures/patients, p=0.080, see online supplementary figure S3) and fewer positive cultures than placebo-treated asthmatics (average 0.6 positive cultures/patients vs 2.7/patient in the placebo group, p=0.052, see online supplementary figure S3). In addition, vitamin D-treated asthma patients showed significantly fewer cultures positive for fungi (Candida and Aspergillus) compared with placebo-treated asthmatics (p=0.0476, see online supplementary table S5). For BE or COPD patients there was no clear trend or significant effect in bacterial cultures or microbiology. There was no statistically significant difference between the vitamin D3 or placebo groups when nasal fluids were analysed for the presence of antimicrobial peptides (AMPs). Initially, the levels of both LL-37 and HNP1-3 tended to be higher in the placebo group (see online supplementary figure S3, panels A and B). However, after 12 months the microbiological pattern was reversed and no primary pathogens could be detected in nasal swabs from vitamin D3-treated patients (n=25, p=0.039; see online supplementary figure S4, panel C). The placebo-treated patients exhibited the same mix between normal flora and primary pathogens at all three sampling points (0, 6 and 12 months; see online supplementary figure S4, panel C). Most genetic variants did not affect the primary endpoint. However, patients carrying the ‘AA’ genotype in the CYP2R1-gene, encoding the 25-hydroxylase enzyme, had a larger benefit of vitamin D3-supplementation (–55%) compared to AG or GG carriers (–6%) (n=124, p=0.046 for interaction, see online supplementary table S6). In total, the vitamin D3 group reported 38 adverse events (AEs) versus 56 AEs in the placebo group. The most common symptoms in the treatment group were headache (n=5) and lumbago (n=5), whereas placebo-treated patients reported paresthesias (n=8), diverticulitis (n=4) and urinary tract infection (n=4) as most frequent AEs (table 5, see online supplementary table S7). There was a general trend towards the number of adverse events being higher in the placebo group. Significantly more patients in the placebo group reported cardiovascular problems, such as heart failure, hypertonia and thrombosis (p=0.028). For gastrointestinal and other (non-respiratory) infections there was also a trend favouring the vitamin D3 group (p=0.058 and 0.09, respectively). No clinically relevant changes in serum levels of calcium, phosphate, creatine or albumin could be observed (see online supplementary figure S5). There was one severe adverse event in each group (rabdomyosarcoma in the vitamin D3 group and lung bleeding in the placebo group), both judged as being unrelated to the study drug. The main conclusion from this long-term RCT is that vitamin D3 supplementation reduces the total burden of respiratory tract infections. The primary endpoint was composed of five different parameters that patients recorded daily throughout the study year. All point estimates favoured the vitamin D3 group and a statistically significant effect was seen on both the total score and on the probability of receiving antibiotics (p<0.05). The effect on the infectious score was evident both in analysis per-protocol and according to ITT, and withstood adjustment for potential confounders. In addition, the number of bacterial cultures and microbiological findings was significantly reduced in the intervention group. These findings are potentially important and support that Vitamin D3 supplementation may prevent respiratory tract infections and reduce antibiotic consumption, particularly in patients with hypogammaglobulinaemia or with an increased frequency of respiratory tract infections. However, our study has several limitations: First, the choice of primary endpoint may be questioned since it relies solely on patient-reported information. To compensate for inherent problems with patient-reported data, the evaluation instrument was designed to cover many aspects of an infectious episode, including various symptoms as well as antibiotic consumption. Together the reported data formed an ‘infectious score’, which constituted the primary endpoint of the study. Similar composite scores have successfully been applied to different diseases, such as tuberculosis (TB-score16), pneumonia (CURB-6517) and bacterial meningitis (BMS-score18). Notably, vitamin D supplementation had a major effect on the odds of taking antibiotics during the study period (a reduction by 63.5%). In addition, the absolute number of days on antibiotics was reduced by 50% (from 33 days in the placebo group to 16 days in the intervention group), which was statistically significant both in the adjusted and unadjusted analyses (table 1). However, despite the relatively modest reduction for the other components of the primary endpoint the overall infectious score was significantly reduced—mainly as a result of the large effect on the antibiotic parameter—both in the unadjusted and in the adjusted analyses (table 1 and figure 2). It is important to interpret the statistical significance in light of our power calculation, which was based on a significance level of p=0.02. In the power calculation, the significance level was reduced from 0.05 to 0.02 in order to increase the statistical power at the p=0.05 level. This approach was incorrect, and the targeted power (at the p=0.05 level) should instead have been increased without altering the p-value threshold. However, we have used the widely accepted significance level p=0.05 in the statistical analyses for both the primary and secondary endpoints, respectively. Another potential problem was that the patient population was very heterogeneous with regard to immune deficiency and concomitant diseases. We adjusted for these factors in the multivariable analyses of the primary endpoint, but the sample sizes in each subgroup were too small to draw any conclusions of effects in specific disease groups. However, a detailed post hoc analysis of the relation between immunological diagnosis, concomitant lung disease and the secondary endpoints ‘taken bacterial cultures’, ‘positive bacterial’ cultures and ‘microbiological findings’ was performed. There was a clear trend that vitamin D-treated patients with subclass deficiency and/or asthma produced fewer bacterial cultures, fewer positive cultures and fewer fungal cultures (see online supplementary tables S4 and S5 and figure S3). Although this analysis may lack precision by the small number of patients included, it could have clinical implications regarding target groups for vitamin D3 supplementation. Importantly, our study is the first to utilise high daily doses for an extended period of one full year. Thus, we covered all four seasons, which was important in Sweden with a known seasonal variation in 25-hydroxyvitamin D3 levels.25 Two previous RCTs were performed during the winter season—when vitamin D levels are low—but only during 422 and 6 months,20 respectively. Previous RCTs have been conducted during shorter periods; 42 days,23 6 weeks26 and 12 weeks,21 respectively. Interestingly, we observed a clear time-dependent effect suggesting that a long-term supplementation approach (>6 months) may be necessary to affect immunity. To expand on the results of a previous study in healthy individuals where no difference between the intervention and placebo groups was observed,21 we chose a study population with frequent RTIs and at least 42 days with infection during the year prior to inclusion. Notably, patients in the study represent a selected group of individuals with frequent RTI, although the immune disorders that they represent (sIgAD, IgG-subclass deficiency and patients with no defined immune disorder) are generally mild in character and dominated by mucosal RTIs. We also included a small number of CVID-patients, which can be considered to be a more severe immune disorder, but all these patients are treated with IgG replacement therapy and thus well controlled. Hence, the results from this study cannot directly be applied to the general healthy population. Nevertheless, the results provide solid support for additional interventional studies of vitamin D3, especially in groups consuming large amounts of antibiotics. Given that vitamin D3 induces LL-37 in epithelial cells and that LL-37 kills bacteria in vitro, we expected a reduction of the classical bacterial pathogens H influenza, M catharralis and S pneumonia in the intervention group. However, the frequency of these bacteria was not reduced but a reduction of S aureus and fungal species that often colonise the airways was observed. This could be explained by specific effects by vitamin D3 on immunity against S aureus. In fact, vitamin D3 induces human β-defensin-2 (HBD-2) with bactericidal activity against S aureus.29 A recent study showed that low vitamin D3 levels were associated with an increased risk of being colonised by this bacterium.30 Further, vitamin D3 affects immunity against C albicans, which indicates direct effects of vitamin D3 on human immunity.31 Alternatively, it is possible that vitamin D3 may have prevented symptomatic viral infections, which prompted patients to leave a bacterial sample from the airways. Interestingly, there is both mechanistic and clinical evidence that vitamin D3 can prevent viral infections,32–34 although we did not address this in the current study. Notably, we observed a prominent increase in the serum concentration of 25-hydroxyvitamin D3, which indicated good compliance and tolerability of the study drug. In fact, there was a trend towards adverse events being reported more often in the placebo group, suggesting that vitamin D3 possibly could be efficient against other diseases, but this observation requires further studies. No clinically relevant changes of blood chemistry (calcium, phosphate, albumin or creatine) were observed. Despite few adverse events and high tolerability, 16 exclusions occurred during the study year. The main reason was problems to adhere to the protocol and 6/16 patients dropped out of the study after a few weeks. The rest failed to send in the diaries, did not leave blood for monitoring of safety parameters or did not take the study drug. One patient was excluded based on symptoms that could be attributed to vitamin D3 (facial paraesthesia). However, this patient was later confirmed to have been allocated to placebo. In summary, we found that supplementation with vitamin D3 reduced the total infectious score with 47 points per patient (23% reduction in the adjusted analysis) during the study year. The observed reduction was lower than the assumed reduction of 70 points per patient (predefined assumption: 210 points=>140 points; a reduction of 30%) that formed the basis for the power calculation. However, despite the predefined level of a reduction of infectious score by 30% as a clinically meaningful effect, we believe that effects lower than this also could be relevant for the individual patient. We base this line of reasoning on the fact that a reduction of 47 points per patient can be translated into 47 days with cough (47 points), 23 days with ear and sinus symptoms (23×2=46 points) or 9 days with cough, sinus and ear symptoms together with malaise and antibiotics (9×5=45 points). In addition, our data indicate that vitamin D3 supplementation reduces the odds of taking antibiotics by approximately 60% in patients with frequent respiratory tract infections. Thus, supplementation with vitamin D3 could provide a novel strategy to reduce antibiotic use among high consumers and indirectly prevent the emerging epidemic of bacterial resistance.
. Experimental rickets in rats. III. The prevention of rickets in rats by exposure to sunlight. J Biol Chem 1922;50:77–81.
. Photosynthesis of previtamin D3 in human skin and the physiologic consequences. Science 1980;210:203–5.
. Vitamin D deficiency. N E J M 2007;357:266–81.
. Vitamin D effects on lung immunity and respiratory diseases. Vitam Horm 2011;86:217–37.
. Antibacterial effects of vitamin D. Nat Rev Endocrinol 2011;7:337–45.
. Vitamin D deficiency is associated with tuberculosis and latent tuberculosis infection in immigrants from sub-Saharan Africa. Clin Infect Dis 2008;46:443–6.
. Influence of vitamin D deficiency and vitamin D receptor polymorphisms on tuberculosis among Gujarati Asians in west London: a case-control study. Lancet 2000;355:618–21.
. Association between serum 25-hydroxyvitamin D level and upper respiratory tract infection in the Third National Health and Nutrition Examination Survey. Arch Inter Med 2009;169:384–90.
. Toll-like receptor triggering of a vitamin D-mediated human antimicrobial response. Science 2006;311:1770–3.
. Immunosuppressive actions of 1,25-dihydroxyvitamin D3: preferential inhibition of Th1 functions. J Nutr 1995;125(6 Suppl):1704S–8S.
. Vitamin D3 attenuates Th2 responses to Aspergillus fumigatus mounted by CD4+ T cells from cystic fibrosis patients with allergic bronchopulmonary aspergillosis. J Clin Invest 2010;120:3242–54.
. Vitamin D and immune function: an overview. Proc Nutr Soc 2012;71:50–61.
. Vitamin D for treatment and prevention of infectious diseases: a systematic review of randomized controlled trials. Endocr Pract 2009;15:438–49.
. TBscore: signs and symptoms from tuberculosis patients in a low-resource setting have predictive value and may be used to assess clinical course. Scand J Infect Dis 2008;40:111–20.
. CRB-65 predicts death from community-acquired pneumonia. J Intern Med 2006;260:93–101.
. Sensitivity of the bacterial meningitis score in 889 children with bacterial meningitis. J Pediatr 2008;152:378–82.
. Human serum 25-hydroxycholecalciferol response to extended oral dosing with cholecalciferol. Am J Clin Nutr 2003;77:204–10.
. Vitamin D supplementation for the prevention of acute respiratory tract infection: a randomized, double-blinded trial among young Finnish men. J Infect Dis 2010;202:809–14.
. A randomized controlled trial of vitamin D3 supplementation for the prevention of symptomatic upper respiratory tract infections. Epidemiol Infect 2009;137:1396–404.
. Randomized trial of vitamin D supplementation to prevent seasonal influenza A in schoolchildren. Am J Clin Nutr 2010;91:1255–60.
. High doses of vitamin D to reduce exacerbations in chronic obstructive pulmonary disease: a randomized trial. Ann Intern Med 2012;156:105–14.
. Seasonal variation in blood drug concentrations and a potential relationship to vitamin D. Drug Metab Dispos 2011;39:933–7.
. The effect of vitamin D as supplementary treatment in patients with moderately advanced pulmonary tuberculous lesion. Acta medica Indonesiana 2006;38:3–5. Thijs W, Janssen K, Verhoosel RM, et al. Effect of vitamin D treatment on antimicrobial peptides in asthma pathients and healthy controls, Conference Abstract, European Respiratory Society, 2011.
. Impaired release of antimicrobial peptides into nasal fluid of hyper-IgE and CVID patients. PLoS One 2011;6:e29316.
. Cutting edge: 1,25-dihydroxyvitamin D3 is a direct inducer of antimicrobial peptide gene expression. J Immunol 2004;173:2909–12.
. Staphylococcus aureus nasal carriage is associated with serum 25-hydroxyvitamin D levels, gender and smoking status. The Tromso Staph and Skin Study. Eur J Clin Microbiol Infect Dis 2012;31:465–73.
. 1,25-Dihydroxyvitamin D3 modulates cytokine production induced by Candida albicans: impact of seasonal variation of immune responses. J Infect Dis 2011;203:122–30.
. Vitamin D and the anti-viral state. J Clin Virol 2011;50:194–200.
. Vitamin D decreases respiratory syncytial virus induction of NF-kappaB-linked chemokines and cytokines in airway epithelium while maintaining the antiviral state. J Immunol 2010;184:965–74.
. Serum 25-hydroxyvitamin d and the incidence of acute viral respiratory tract infections in healthy adults. PLoS One 2010;5:e11088. Contributors PB designed the study, collected, analysed and interpreted data, wrote the paper. A-CN designed the study, collected and interpreted data, wrote the paper. SH designed and coordinated the study, collected and interpreted data. RSR carried out experimental work and analysed data. BA analysed and interpreted data, wrote the paper. LB-B analysed and interpreted data, wrote the paper. LE analysed and interpreted data. JL analysed and interpreted data, wrote the paper. JA designed the study, interpreted data, wrote the paper. Funding The study was supported by grants from Swedish Research Council Projects 2009-2950 (JA) and 2010-4199 (BA). Strategic Research Foundation (SSF), Swedish Heart and Lung foundation, Karolinska Institutet, Stockholm County Council, Swedish Cancer Society, Magnus Bergwall and Åke Wiberg foundations. Merck GmbH provided the study drug (Vigantol) but did not have any influence on study design, analysis of data, writing or decision to publish. Ethics approval The study was approved by the local Ethical Committee and the Swedish Medical Product Agency and was performed in accordance with the declaration of Helsinki. Written informed consent was obtained from all study participants.